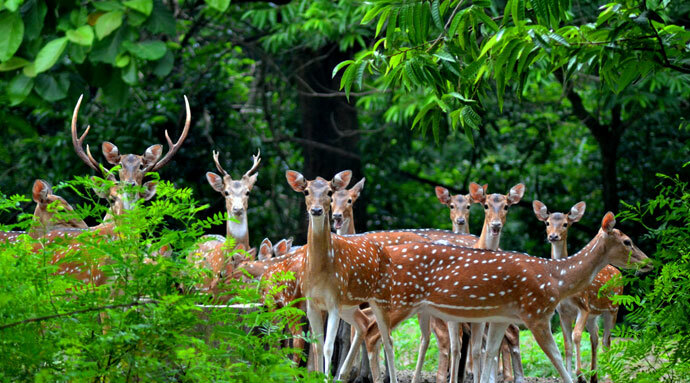 Bethuadahari Wildlife Sanctuary The WLS is situated in the Nadia District, West Bengal,spread over an area of 67 hectares it was established in 1980, has a large population of Spotted deer, Jackal, Bengal fox, Porcupine, Common Langur. Other species includes Parakeets, Indian Cuckoo, Barbets and other smaller birds and pythons. It is located in the Nakashipara area. As per the 1995 census, it had 297 deers. It has about fifty species of wildlife including python, jungle cat, porcupine, monitor lizard, and a variety of snakes and birds.